The Dutch call it ‘een vette bek halen’ – literally ‘to get yourself a greasy gob’ or pigging out on fried food. The snack bars stock an interesting selection. Here are the most popular. Please note, the Dutch often use the diminutive form for their snacks – a kroketje, a sateetje, a patatje, in an attempt to minimise calorific value. 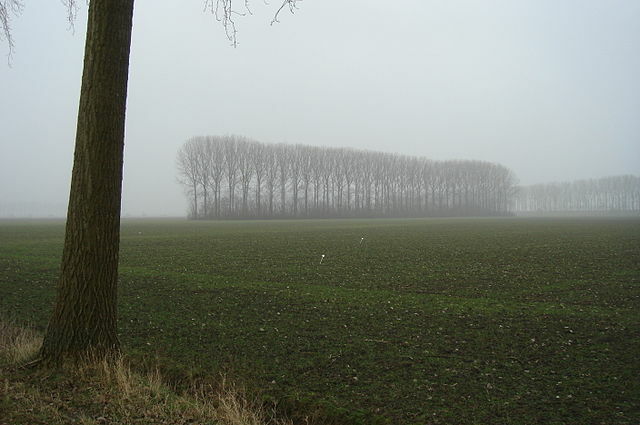 Saté was brought to the Netherlands by people from the Dutch former colony of Indonesia. It is originally a delicate little dish of meat on a bamboo stick served with a sambal, ketjap or peanut sauce. Here it has degenerated into a few chewy skewered lumps of unidentifiable origin drowned in a sauce made with peanut butter. The snack bar loempia (spring roll), nasibal (filled with rice) and bamibal (filled with noodles) are also distantly related to Indonesian food. They were made popular by the Chinese restaurants which began to proliferate in the Netherlands in the 1950s. These often employed Indonesian cooks who brought their own recipes. When nasiballs and bamiballs began to be manufactured in factories, their shape changed from a ball to something resembling an ice hockey puck and in their frozen state they could, indeed, be used as one. A turkeystick is a kebab made with bits of turkey, chicken and onion rings, all deep fried of course. A patatje oorlog (French fries war) is usually chips with mayonnaise, peanut (butter) sauce and raw onion. If you go to Noord-Brabant or Leiden they add curry sauce to the mix and call it French fries ‘nuclear war’. Just that: a cheese soufflé only deep fried. 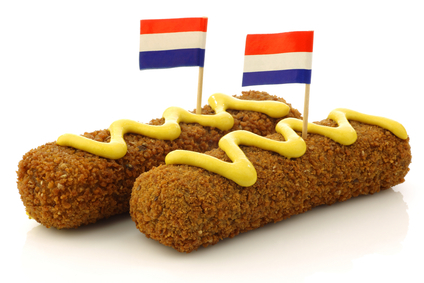 Croquettes are probably one of the Netherlands’ favourite snacks. They can be eaten with mustard and are great on bread. You will get points for guessing which type of meat is mixed in with the goulash type sludge that is in them. The kroket is something most foreigners in the Netherlands develop a secret liking for. In the delicate language of the snack bar, a berehap is an enormous (like a bear), deep fried concoction of sliced meatball on a stick, interspersed with onion rings. The healthy option comes with pineapple. A deep fried, absurdly elongated sausage made with different kinds of meat. This snack has been around since the seventeenth century. Rumour has it that frikandellen are filled with a yummy mixture of meat from udders, cows eyes and fat. This is, of course, strenuously denied by frikandellen manufacturers. The truth is that frikandellen are made with what Dutch meat processors call ‘separated meat’ – ie the meat left on the bones of chickens, pigs and horses (yes, some manufacturers use a bit of horse as well) after they have been filleted. The kapsalon – literally hairdressers salon – was reportedly invented by a Cap Verdian hairdresser in Rotterdam who asked his local snack bar to combine all his favourite fast food into one dish. The classic kapsalon consists of French fries covered with doner kebab or shwarma meat and melted cheese, then topped with some lettuce and tomato for vitamins. Often served with garlic sauce and sambal. Not all snacks are the devil’s food, or Dutch. This one happens to be Belgian but the Dutch love it too. Some snack bars serve the real thing: chips made from real potatoes with a creamy, home-made (or close to) mayonnaise. Delicious.